Following the directions in our three-year-old guidebook, we rented a couple of cycles at the station and headed for a sushi restaurant reputed to sell very fresh fish. However, in the intervening years, the restaurant had apparently ceased to exist, leaving us still hungry and having wasted 3/ 4 hour of the rapidly diminishing sunshine—irritating because the forecast for the next day predicted rain. 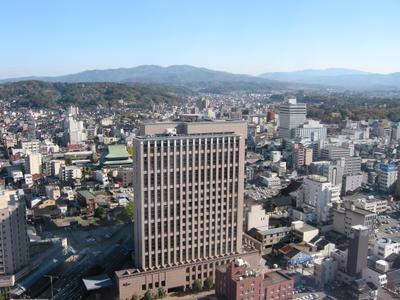 We elected to cut our losses and aim for Kenrokuen (兼六園), hoping to find something to eat near the market on the way. Unfortunately, thanks to the large building site in front of the station, we ended up on the wrong road. Even once we corrected our route, we went off course again, ending up on the wrong side of the river and with the sun getting lower and lower. We grabbed some onigiri (rice balls) and a can of beer at a convenience store and stopped outside to have our meager lunch. We eventually arrived at Kenrokuen around 15:00, with only an hour and a half remaining before the garden closed. As it turns out, an hour and a half is plenty of time to see the park—it’s not actually all that big. It contains within its compact size a very good Japanese garden boasting, among other sights, the first waterfall in Japan—a most unimpressive example of the genre, if the truth be told. After a nap at the hotel—very comfortable thanks to our free room upgrade—we went to an izakaya (居酒屋) restaurant for a meal of various small dishes. I had a couple of different types of local sake, one of which, the fifteen-year-old kuro-obi (“black belt”) was very nice indeed. Happily, despite prognostications of rain, the following day turned out to be fine yet again. After the clouds that covered the sky in the early part of the morning were blown away around 10:00, it was hot enough to pass for summer in England. Kanazawa Castle Park (金沢城公園) was almost completely deserted when we arrived, and it felt as if we had the entire place to ourselves. 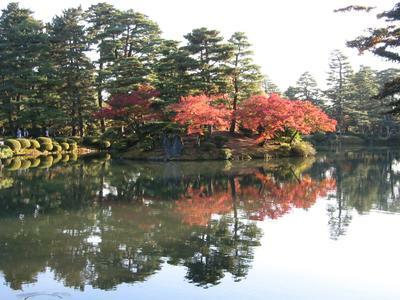 In fact, the castle park is probably a better attraction that Kenrokuen. As well as being free, it’s a lot bigger. 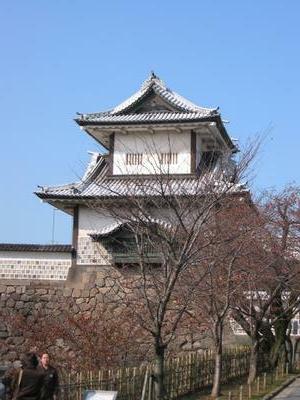 There is one of the typically Japanese fake/replica castles built on the original lower walls that you do have to pay to enter. However, mindful of the disappointment that invariably waits inside such ersatz attractions, we avoided it.